My grandmother recently passed and part of adulting is helping to clean out your loved ones possessions. It isn’t a fun thing to do, but it has to fall to someone. Part of my responsibility was to clean out the closets and decide what could be consigned. In doing so, I found a really awesome Ghurka bag, canvas with leather trim. It was spectacular. The downside was that it had a couple of pretty noticeable spots and smelled like moth balls. I took the bag to the local dry cleaners who were very honest with me. They said that it would cost $25 to find out if the spots would come out, but it was highly unlikely. I decided not to move forward as the professionals tend to know spots and would encourage me if there was a chance. So I ‘researched’ online and found a Pinterest pin on how to wash your leather purse. I typically am quite enamored with One Good Thing by Jillee, and if she said that you could wash leather in your washing machine, well, I was damn sure to try it. Now, she is quite clear on the fact that this might not work. Feeling that this was the last chance, I went for it. 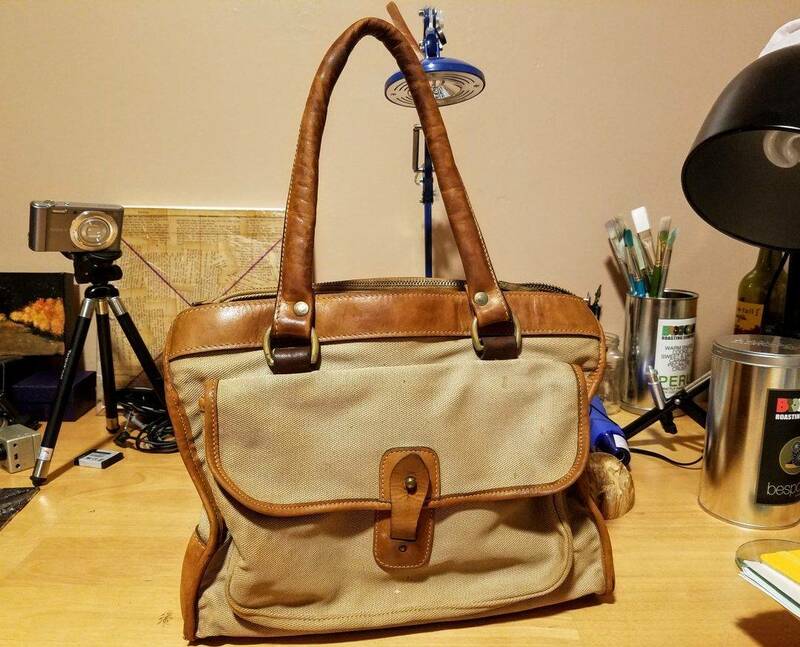 I put the Ghurka bag in the washing machine with Dr. Bronner’s Peppermint Castile Soap and let ‘er rip…on the gentle cycle. Taking the bag out, I could see that the spots were still there and there was some damage to the leather piping. That was the first bummer. Really loving the bag and wanting to keep this cool artifact from my grandmother’s closet, I let it dry and then put all the trappings of my purse into it and went to work. I made it through the entire day and I swear to God, the smell just got worse as the day went on. It started off smelling of peppermint and mothballs and then added a musty, rotting smell. As much as I cared for my grandmother and wanted this bag as a memory, I could not tolerate the stench. When I went to drop some things off at the Salvation Army, the bag went with it. All of the items I carried in the purse that day returned home that night on the seat of my car. So, while I trust that Jillee got the results she shared on her post, I can say for sure that it doesn’t always work! Really use this as your last resort when you will either save the item or throw it away.